I don’t know why but during the end of the sermon this morning at church , just about a minute before the pastor let us all go home , suddenly i thought about fried chicken . No , not thinking about buying fried chicken , because that’s what we usually do , i don’t cook fried chicken , i know they’re easy but i don’t , just because to me it seems pointless spending about a gallon of oil just to fry chicken , not to mention , it is unhealthy . 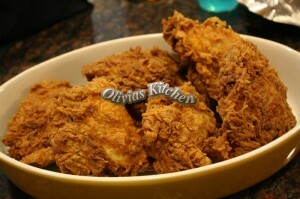 We usually settled with oven baked fried chicken , similar but not quite the same original fried chicken . We stopped at grocery store , didn’t pick up anything but chicken and southern hot sauce , you know the american hot sauce that is hot ( well just warm .. mild not too hot ) and super sour , due to the vinegar content in there . Not my favorite kind of hot sauce but i deal with it since i need it for this darn chicken . So , i picked up another thing , picked up tomatoes because i wanted to make ” indonesian hot sauce with shrimp paste ” and of course we ended up picking up some other things such as milk and eggs since we ran out of it . I guess fried chicken must be very popular in the southern state , since i found lots of recipes online that said ” southern fried chicken ” Is there any difference between southern and northern fried chicken ? Heck .. i don’t know .. how could fried chicken be any different anyway from different location .. they’re all chicken , being deep fried ! 1. Heat up oil in a big pot or deep fryer , to 350 F , fill it up half way , enough to submerge the chicken , you want to deep fry the chicken . 2. Place the chicken in a cookie sheet and sprinkle with salt , garlic powder and black pepper , both sides . Set aside . 3 . Beat the eggs with water and hot sauce until it’s bright orange color shows up . Set aside . 4 . Mix the flour with baking powder and smoked paprika and salt . Set aside . 5 . Dip the chicken into the egg hot sauce mixture , then dredge the chicken on the flour until it’s all coated , drop them carefully into hot oil , cook for about 13-14 minutes for dark meat and 10 minutes for white meat .